Partners Albania for Change and Development organized on July 7th, the opening ceremony of “KeBuono!”, a social pastry established by “Engim” and “Qendra Sociale Murialdo” organisations, in a confiscated asset from the organized crime in Fier. KeBuono! is established in the framework of the “C.A.U.S.E – Confiscated Assets Used for Social Experimentation” project, implemented by Partners Albania for Change and Development, in partnership with Project Ahead and Comitato Don Peppe Diana and in collaboration with the Agency for the Administration of the Sequestered and Confiscated Assets. The project is funded by the European Union. 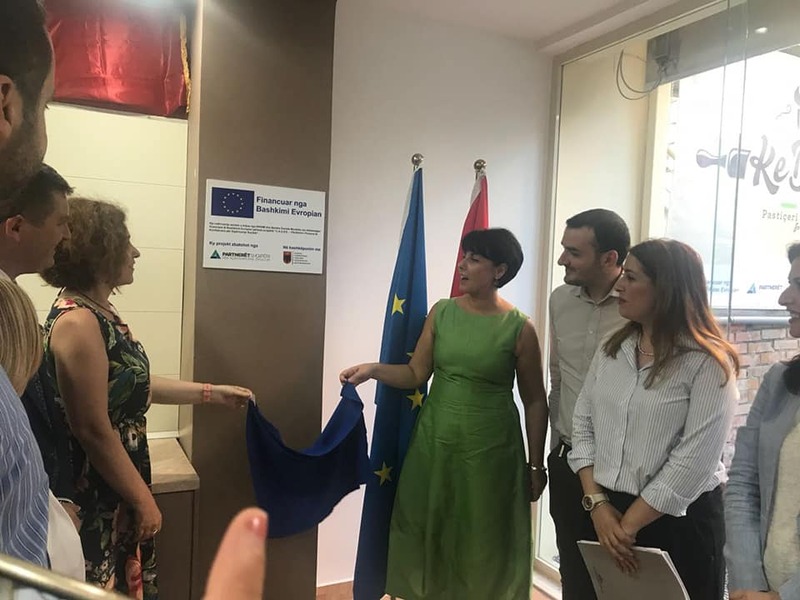 CAUSE project, the first of its kind, can be seen as part of a larger mosaic, which is the successful implementation of the Justice Reform and the fight against organized crime in Albania, supported by international partners as well. Being the first initiative of its kind in Albania and the Western Balkan countries, KeBuono will transform cooking and sweets into opportunities to stimulate social cohesion for disadvantaged people, thus enabling them to recruit and regenerate dignity and a role within society. It will support and reinforce the self-confidence by finding a job and building new human relationships to young people endangered by crime or assigned to the probation service and women victims of violence, divorced or married with men convicted in prison. The inauguration ceremony was opened by Mrs.Juliana Hoxha, Director of Partners Albania which thanked and welcomed the guests. “When we started this journey, it seemed like an impossible mission for many people. But we dared and here we are today with “Ke Buono”, as a meaningful and concrete expression of success” – said Mrs. Hoxha. The ceremony was greeted by Mrs. Romana Vlahutin, Ambassador of the EU Delegation to Albania. “We are proud to witness how this has become a reality. It’s not about a bakery but about Rule of Law. All Albanian society must get involved to fight organized crime. This courageous work sends out a clear message that what is stolen from society can and should be given back to society. The EU strongly supports use of confiscated assets for the social good.” – said Mrs. Vlahutin. The ceremony was attended by Mrs.Vasilika Hysi, Deputy Speaker of the Albanian Parliament, Mrs.Ogerta Manastirliu, Minister of Health and Social Protection, Mrs.Etilda Gjonaj, Minister of Justice, Mr.Besfort Lamallari, Deputy Minister of Internal Affairs, Mr.Elton Haxhi, Deputy Minister of Finance and Economy, Mr.Artur Kala, Head of the Agency for the Administration of Sequestered and Confiscated Assets, Mrs.Enkeleda Peshkëpia, Deputy Mayor of Fieri Municipality, etc. In a panel discussion organized during the ceremony, they discussed on the issues and challenges on re-use of the confiscated assets from the organized crime for social purposes, the legal framework and other related regulations on effective management of these assets from civil society organisations, the implementation of the Law on Social Enterprises, and the impact that such projects have in the fight against the illegal activities. They welcomed the project and expressed their willingness and commitment to facilitate the replication of this innovative model through the legal and regulatory framework. 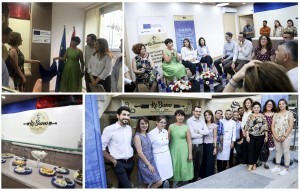 After the discussion, Mrs. Hoxha and Mrs.Vlahutin displayed the plaque of the project and invited the participants to visit the reconstructed premises of the pastry shop, by having the opportunity to also watch the images of the transformation of the property by the benefiting organizations through the support of CAUSE project. At the end of the event, the participants tasted sweets and pastry products at a cocktail organized in the pastry premises. Partners Albania is working to spread this successful model in other confiscated assets from the organized crime in other cities of Albania.